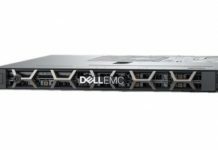 The Dell EMC PowerEdge MX has a forward-looking storage solution as well. Each node has the ability to have some internal storage. Beyond this internal storage, the chassis has the ability to host additional storage in dedicated storage sleds. We have this section after the networking section of our review because Dell EMC has a similarly forward-looking solution here. First a look at the sleds. 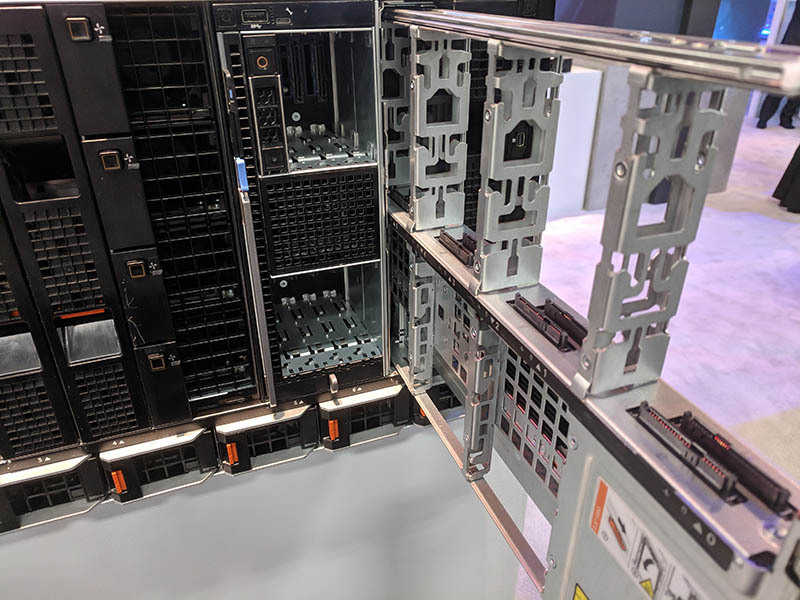 Here is a static model of the Dell EMC PowerEdge MX5016s SAS storage sled. The PowerEdge MX5016s sleds can be utilized in up to 7 sleds per PowerEdge MX7000 chassis for up to 7x 16 drives or 112 drives. 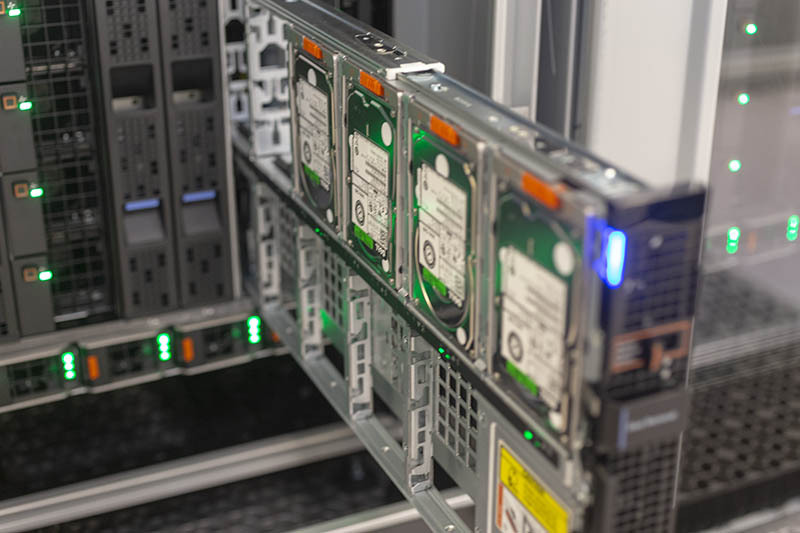 The drives, when installed, are hot-swappable and easy to service when one pulls the sled out. One other aspect one can see is that the SAS expanders are hot-swappable and plugged directly into the bottom of the PowerEdge MX5016s. The design allows for one to quickly service the expanders. As of our review’s publication date, this is the only sled publicly available. 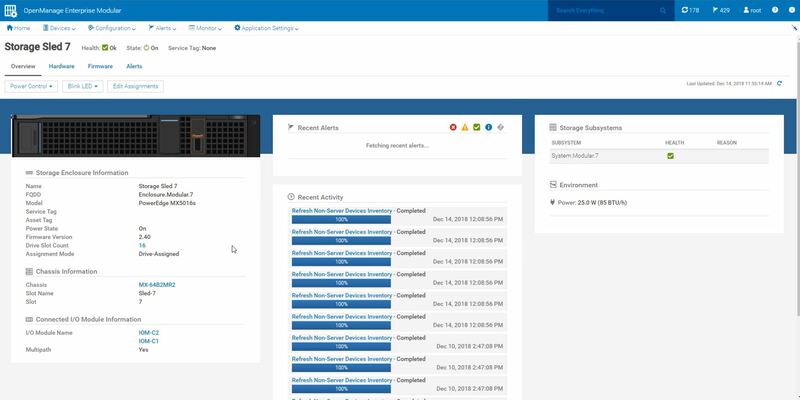 We have a strong suspicion that there will be an NVMe storage solution implemented in the PowerEdge MX using PCIe switches and NVMe SSDs at some point in the future. 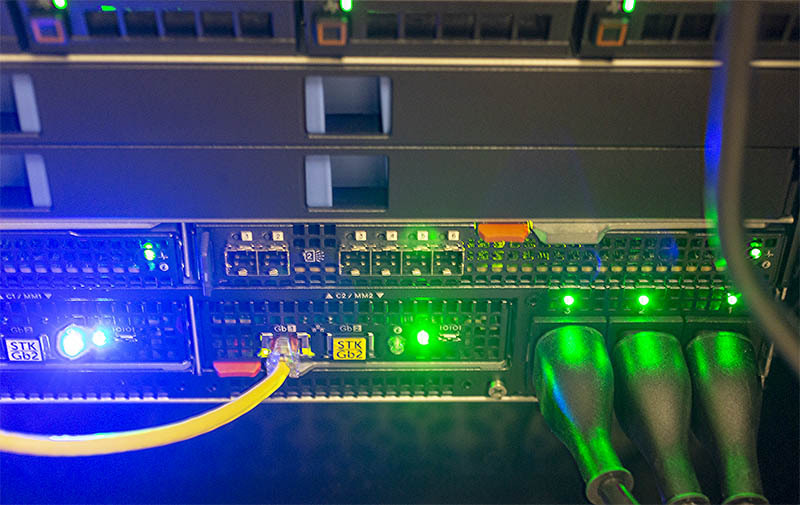 Instead of utilizing cabling or a storage midplane, the PowerEdge MX utilizes a fabric module. On one hand, this may seem like a simple solution, but the impact is profound, much like with the networking backplane. We are currently in the midst of a transition. Yesterday’s storage of SAS is giving way to NVMe and NVMe over Fabric (NVMeoF.) Next generation storage may be connected to something different. Utilizing a fabric module here, without a midplane makes a lot of sense, not just for the distant future. In 2019, we will see PCIe begin to transition from PCIe Gen3 to Gen4, effectively doubling the per-lane bandwidth. Not long after, we will see a transition from PCIe Gen4 to Gen5. That doubling of bandwidth is a great thing for storage and networking peripherals. On the other hand, it is not something that will work well with traditional midplanes. As signaling speeds go up over interfaces like PCIe, PCB trace lengths are coming under intense pressure. 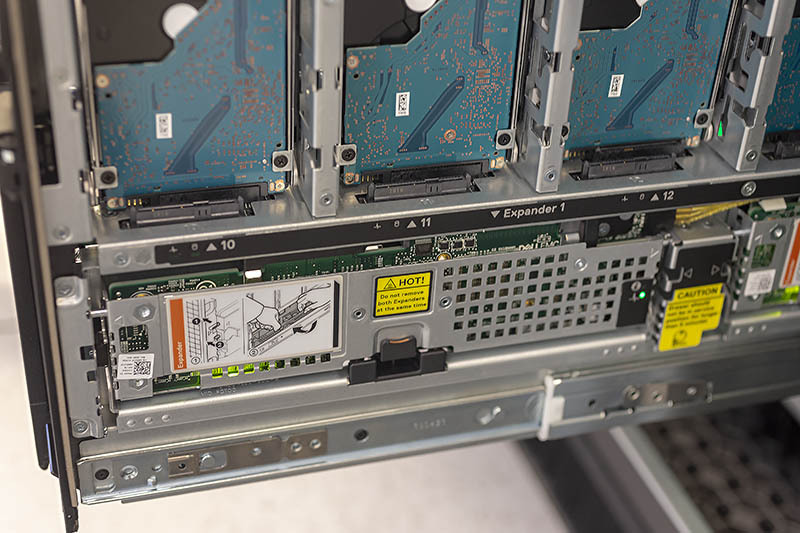 As we move from PCIe Gen3 to Gen4 in servers, even platforms like the AMD EPYC 7000 will see many motherboard PCB’s reworked with higher-quality (and cost) PCB to allow for Gen4 signaling in the same chassis. In a larger blade chassis, using a PCB midplane creates challenges as signaling tolerances increase. By utilizing a fabric module, the Dell EMC PowerEdge can keep the back-end fabric, plus any necessary elements such as PCIe expanders, SAS expanders, on a single module. That is significantly easier to upgrade over the longer term. Like other aspects of the Dell EMC PowerEdge MX, the storage fabric and drive sleds are manageable over the company’s management interface. The parting thought after poking and prodding the Dell EMC PowerEdge MX storage subsystem is that it truly is built for future generations. If NVMeoF becomes dominant, then one can switch the storage module and mezzanine cards and run that in the PowerEdge MX. Likewise, if the market moves where we have something akin to Intel Optane or another persistent memory running over Gen-Z, in theory, the Dell EMC PowerEdge MX is built to handle that. 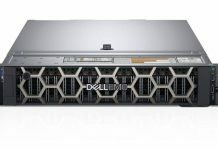 Again, that is a hypothetical, but the design of the PowerEdge MX is such that Dell EMC could deliver that in today’s chassis if that is where the market develops in a few years. 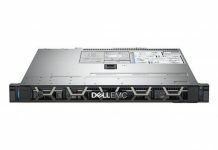 Since customers are buying into the PowerEdge MX platform for years to come, this is a serious consideration.